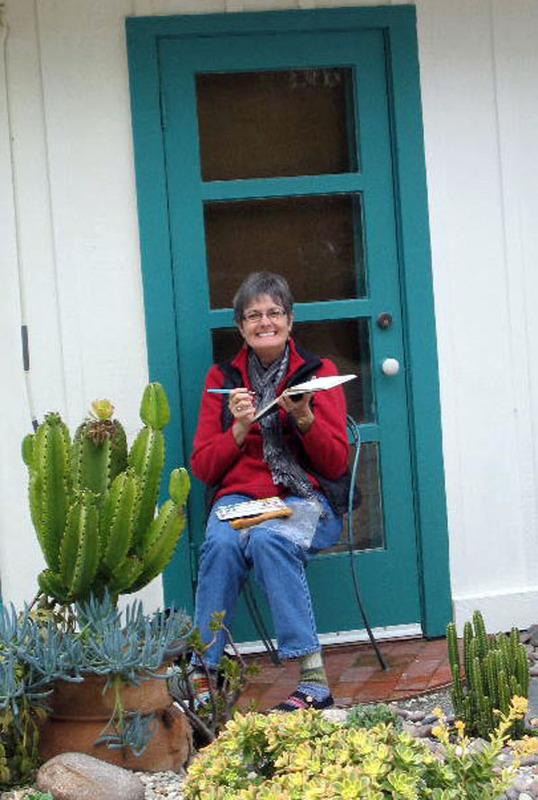 Jane LaFazio is a mixed-media artist, teacher, and author. Working primarily in paper and cloth, Jane teaches classes in the San Diego area, internationally at art retreats and leads sketchbook adventures to Italy. In 2010, she began teaching her sketchbook class online. Her much-admired sketchbook work has been featured on the cover of Cloth, Paper, Scissors magazine and in An Illustrated Life: Drawing Inspiration from the Private Sketchbooks of Artists, Illustrators and Designers by Danny Gregory. Jane’s mixed-media art has been featured in Quilting Arts magazine and countless newspaper articles. ArtPlantae Today: How long have you been keeping a watercolor journal? Jane LaFazio: I started a mixed media journal in 2005 and then a dedicated watercolor journal in 2006. APT: You credit Danny Gregory for getting you started. What was the trigger that launched your journaling career? JL: Yes, a friend told me about Danny’s blog and I started following it. Then I got his book Everyday Matters and began drawing in a sketchbook immediately. The following year, I had the fabulous opportunity to meet and sketch with Danny when he visited Los Angeles. APT: In 2010, you began teaching your sketchbook class online at Joggles.com. How is this new format working out for you? JL: Surprisingly well! I really wondered how my in-person teaching style would translate to online and I’m thrilled that it does! With the step-by-step lessons I wrote (loaded with photos) and the online forum that all the students can participate in, I think I really got the message across. And an added bonus was that the online students were just as supportive and friendly to each other as my in my in-person classes. It’s been great! I’m starting a new online class January 20, Sketching & Watercolor: Journal Style ON LOCATION. This will be another challenge for me! But the message I want to share is my love of sketching and painting on location, so I intend to get my students out in the public with their sketchbooks to coffee shops, museums, and parks. APT: What are your preferred sketching materials? Why? JL: I’ve worked in a Moleskine from the very beginning. I like the larger, watercolor version. It’s tidy outside appearance appeals to me somehow! And the books are great to travel with. I’ve got 14 finished ones, lined up on my bookshelf! However, lately I’ve been working with 5×7 inch individual sheets of hot press paper. (I love hot press, and use it for my larger work) I use the small sheets in my classes and now I’m beginning to use it regularly for my own pages. I’m also creating portfolios and boxes to keep the pages in. My watercolor paints are squeezed from the tube into a small travel palette. I use a superfine tip black permanent ink pen, any ol’ pencil, a kneadable eraser and a Niji Waterbrush. The products I use can be viewed on my blog here. APT: Your journal pages exude a lot of spontaneous energy. Is your approach to journaling as spontaneous as it appears, or do you make a point of sitting quietly with your journal on a daily basis? pen. The watercolor part goes fairly quickly. I don’t think a lot about composition of the page, when I’m doing it. It’s only later that I “finish” the page, adding an inked frame and text. My goal is to draw it, ink it, paint it, and scan it for my blog in an hour. Of course, sometimes I spend a longer amount of time on a page, but it just depends how much time I have to devote to it. APT: How long have you been leading sketchbook adventures to Italy? How do you encourage travelers to become engaged with their surroundings? JL: Ah! May 2010 was my first trip as teacher and it was fabulous! Thirteen wonderful students from all over the world. And frankly, it was easy to engage them. Once I taught them the basics of really looking, and how to get what you see down on paper, they were entranced with the beautiful details everywhere. Once a person draws in public, realizes how easy it is and how quickly the feeling of self-consciousness recedes, they love it. In Italy, my classes were usually in the morning, and most afternoons the students could be seen around Orvieto drawing and painting on their own (That is, when we weren’t at a cooking lesson or wine tasting together!). I’m leading another trip in May 2012 and I can’t wait! APT: You teach an after-school program for children. Tell us about Mundo Lindo. How did you come to launch this wonderful program? JL: In 2007 I applied for and received a grant to create a program “to teach my passion.” I love teaching art, and I love teaching to the 4th & 5th grade age group. So I created Mundo Lindo~Beautiful World, a FREE after-school art program. The kids spend 2 hours with me, and we make all kinds of art! We work in watercolor, papier mache, clay, paint, oil & chalk pastels. We’ve done kites, tie-dye t-shirts, treasure boxes, mosaic pots and puppets. The kids come back week after week and the program runs the whole school year. It’s in its 3rd year now and is one of the things I’m most proud of. APT: Many years ago in a class taught by a well-known colored pencil artist, fellow students and I were told artists either see in shades of gray or in color. Do you agree with this assessment? What have been your observations as a teacher? JL: Interesting. I KNOW I don’t see in shades of gray! Color is what attracts me to the subject, and then, I go straight to the contour drawing then the color creates the shading. That’s how I teach. I too, have taken from a well-known colored pencil artist, and she teaches students to start with the shading and gradually flesh out the details. APT: The business aspect of art is a topic of interest to many artists. You market your artwork through classes, exhibitions, books, conferences, and online services such as Joggles.com, and Etsy. How many online services have you used to market your work? What types of things should artists look for as they research online venues through which to market their art? JL: I’m lucky because my background is graphic design and marketing and I really enjoy it. I love my blog. I love Facebook, and always post my blog updates on Facebook. I used to snail mail postcards, now I use Constant Contact and send out a monthly email newsletter listing my classes, workshops, special exhibitions. I’m thrilled when an artist asks me to contribute artwork to their books and nearly always say yes. I’ve written articles for magazines, my faves are Cloth, Paper, Scissors and Quilting Arts, and that helps get my name out too. Artists should be aware of what’s out there in cyberspace, and then hone it down to what they enjoy doing, and where they get the most response. It’s impossible to keep up with all of it, so choose a few sources that work for you. Also, don’t try to tackle it all in one day! Do a little bit each time. For example, if you chose to start a blog, or improve the one you have (by adding Pages, for example). Do it gradually. No need to feel overwhelmed. Same with Etsy. Start by listing a few things, then gradually add more and begin to learn about the marketing aspect of selling online. And Facebook, well, it’s easy, and frankly lots of fun! APT: Thank you, Jane, for sharing your art, outreach activities, and business sense with us. Will you take questions from readers this month? JL: Sure! I’m always willing to help out other artists when I can. I’m fortunate to have a lot of artist friends, who often advise and suggest things to me, so I’m happy to spread the info. This month Jane is taking your questions about sketchbooks, journaling, her online classes and how she teaches others how to capture their world on paper. Feel free to ask about mixed media artwork or marketing too. Please submit your questions to Jane by January 14, 2011. Jane’s replies to your questions will be posted on Monday, January 24, 2011. Send your questions to education@artplantae.com. Please write “Ask Jane” in subject line. UPDATE: See Jane’s Q&A with readers here. Thank you, Lauren. And thank you for visiting!